I've not got much stitching done in May as we've finally had our kitchen re-fitted. It's would have been total chaos anyway but with 3 children as well it's definitely been a challenge. The boys usually take a packed lunch to school but as we had no cooker I said they had to have school dinners so they'd got at least one hot meal a day. Lukie, who was totally opposed to having school dinners came out the first day beaming saying he loved his lunch and he's never having sandwiches again! I have been doing some stitching mostly on my French postcard SAL, finally finished May after the frog visited many many times! Our printer has gone down, it's the power cable, thankfully my dad has printed out June and July for me. Here is a photo of it so far. Peter our DS1 loves it and can't wait to take it to his French lesson to show his teacher...lots more to do yet though! I've also finally managed to finish another one of my UFO's. This one is a small one that I started absolutely ages ago but put away when I started getting close to finishing another big project. It's stitched on a sample of fabric from Sparklies called Spring Greens. The design is called Lazy Daisy and is from a very very old copy of the UK Cross Stitcher magazine, couldn't tell you which one as I've only the pages left not the magazines. Here is a photograph of Lukie's dragon. He comes downstairs every morning and looks at it just to see if I've put any stitches in whilst he's been in bed! As for my Tree of Stitches....lets just say it and DD had a little situation which meant I've had to start it all over again. To show DD I wasn't as upset as she thought I'd be I let her help me pick the new fabric and colours. Obviously my daughter picked pink...don't think she likes any other colour LOL!....so to break up the pink I suggested a green with it just like the pink blossom tree that she can see out of her bedroom window. She's happy so I started stitching it again using pink variegated thread and a green on pale pink 28ct. Decided when Lukie's dragon is finally done I'm going to do a small project that I can finish quite easily as I've done 2 big projects straight off. Then I've told DH that it'll be the Bothy Threads cut thru of Noahs Ark but I'm changing the fabric so will have to order that. I'm also starting to kit up my HAED but not doing it on 25ct over 1 but normal 28ct. over 2. 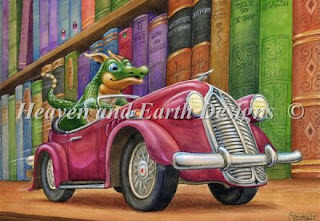 This is the HAED I've picked to do first, it's by Randall Spangler who does the cute dragon designs and this is one of my favourites. Finally here is another photo of our DS1 on his last motorbike lesson. He absolutely loves these lessons, think DS2 and DD love them more as they get to spend the morning with my mum who's built them a playhouse in the garden! Great stitching Jo. 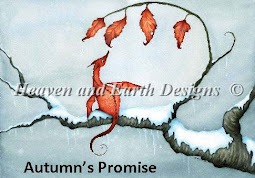 Love your dragon, your tree and also your postcards. Your HAED will look lovely too, and a wise choice to choose a fabric you feel comfortable with. I am so sorry that you had to start your tree of stitches over. It looks great in pink! DS2 dragon looks great too, no wonder he is excited. My son would love that haed except for his pic that should be inside the car.....haven't seen that one. Love your projects. Great update on your stitching and a cute finish. All of your stitching looks fantastic. Love the fabric you chose for the dragon...really makes it pop! Your title was "quick update", you've been very busy! Getting anything done while having a kitchen redone is a miracle. Your pieces are all looking great. Have fun with the HAED. I love working on my Mystics! congrats on finishing an UFO, it looks cute. You've got great projects going, the tree looks nice in that pink!